Now that the polka dot outfit has made its public debut (on Halloween, no less), it’s time to talk about what it was like to wear it. It was conceived as a 1940s-era outfit. The skirt is from Simplicity 3688, a reproduction 1940s pattern, but altered for a contour waistband. 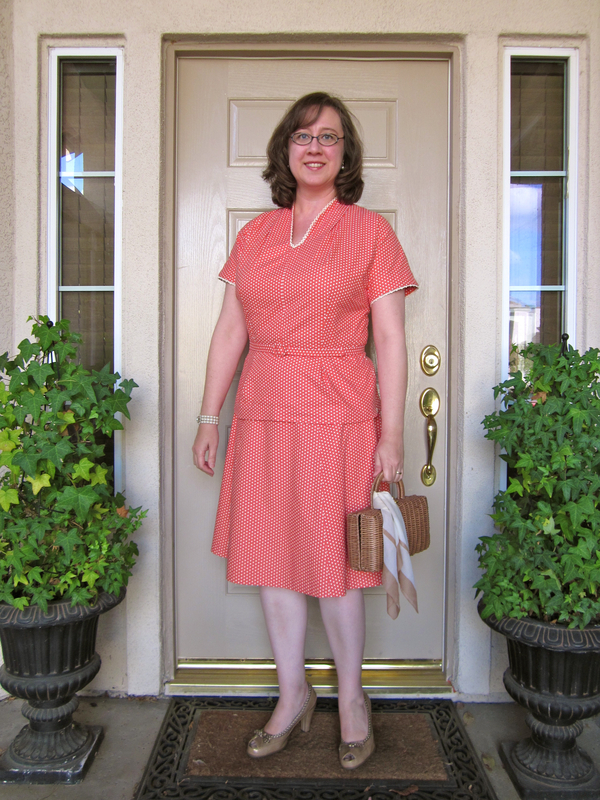 The top is from Simplicity 4047 (out of print), a reproduction 1950s pattern. I have worn it out once, for our Mad Men Halloween at work. The skirt is easy to wear. It’s probably just a smidge too big in the waist, but not so much that I gave it even one thought during the day. I’ve thought about stretching some elastic inside the waistband to make it flexible (my waistline can vary about an inch within a single DAY, particularly when salty pizza is involved for lunch), but I’m not sure I want to mess up how tidy the whole thing is. The top is surprisingly comfortable despite how fitted it is. I knew it was a little tight across the upper back, but this was not at all noticeable during a day spent sitting at a desk and occasionally walking to a copy machine. Even with the belt on, I was completely at ease. I guess if those fitted styles are fitted correctly, they can be worn with total comfort. Also, I love-love-love the neckline! I plan to steal it for a dress some day. 1960s style was required for our Mad Men Halloween. I can’t do a credible job with 1960s hair, so here is a redo, a little more 1940s style. Ah, this is how I intended to wear this outfit! I really like that $7 plastic rattan purse. Look closely. Can you see the polka dot trim on my shoes? No? Too bad — That was the inspiration for the whole outfit! At a certain point on Halloween in my 1960s garb, I had to walk a few blocks through Downtown Sacramento. The only thing that made me at all self-conscious was the pair of white gloves tucked into my belt. Now that I’ve seen it properly styled, I look forward to wearing this outfit again — but probably not until spring! I learned a LOT on this project, so this is overall a winner. Even though this “summer” outfit took me well into October to make! Next up, a wearable muslin of Colette Patterns’ Sencha top. Here is my mood board of the fun cotton I found. If you can’t tell, those crazy space-age shapes are aqua on a brown background. The buttons are aqua, too. I have a long brown A-line skirt I’ll wear this with. I decided to do a wearable muslin because I don’t anticipate needing to alter this pattern all that much. According to the Colette Patterns’ site, the sizes are based on a C-cup; and actual bust measurement should be used when selecting a pattern. With tucks at the waistline, rather than darts to the bust, the construction should be unfitted enough in all the right places not to require much in the way of alterations. I’ll check the bodice for overall length — and see just where those tucks will release on me — but other than that, I may be good to go. Also, I note that the pattern does not call for interfacing in the button and buttonhole areas, which I find curious. I’ll be interfacing them anyway. The Magic 8 Ball says “All signs point to yes” on this wearable muslin idea. Hi Jeannie! I would not call it a postmortem. Its more like tea-time reflection. I like the way you will wear it with the future. Keep the gloves in case you travel to Europe. Wouldn’t it be perfect there at a nice cafe. Your next project is intriguing. I’ve never worked with a Colette pattern. I will keep my eye out. 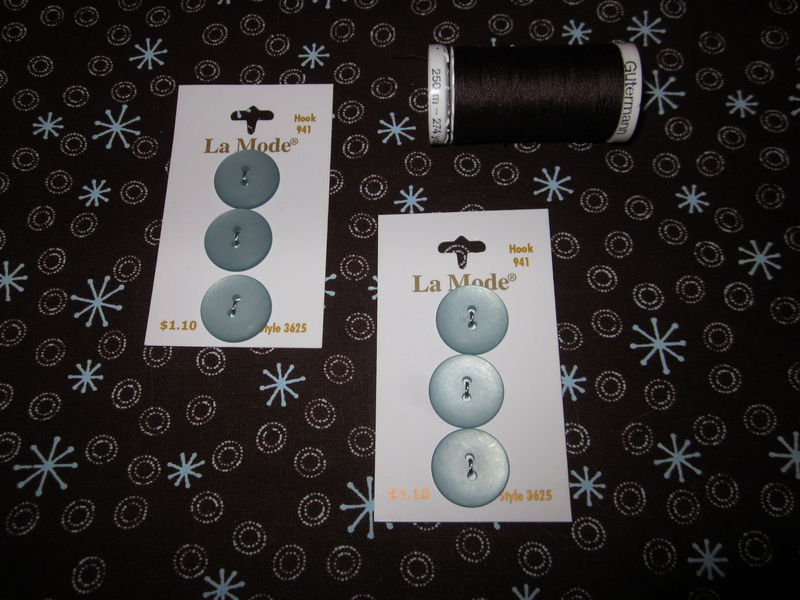 The fabric design in very appealing and the aqua buttons seem a perfect match. Happy Sewing! Thank you! I’m hoping to whip out that Sencha this week. It will be my first Colette Pattern. I’m pretty excited to try it. I think you looked great in the dotted outfit. I have the Sencha too, but it is way back in the line up. Just too cool here and I have lots of winter sewing to do. I will eagerly follow your progress! Thank you, Corinne. I’m going to do the Sencha with the keyhole front and little tie. I’ll definitely update. I’m hoping to get at least some sewing done today, but I’m off to paint pottery this afternoon!